This WolfPack Multi-Audio Switch is a 4x1 Multi-Audio Switch that is also a digital to analog converter. The Multi-Audio Switch can switch any one of the four digital audio input signals to the one SPDIF / TOSLINK audio output as well as one analog R/L output and one headphone output simultaneously. The Multi-Audio Switch works perfect with a sound bar connecting a cable box, DVD player and Game Box to it. Very flexible allowing different audio signals to be output at the same time. 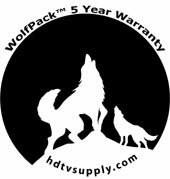 The WolfPack Multi-Audio Switch will allow to be able to hook up your sound bar and AV headphones to your TV. With this Multi-Audio Switch you will be able to use the sound bar and the headphones at the same time. Some use the this Multi-Audio Switch to connect a TV, Apple TV and Bu-Ray player to a ZVOX sound system which has only one digital input. Other soundbars can use it also. Why not buy this Multi-Audio Switch today? FIRST YEAR: The first year is direct with with HDTV Supply at 800-841-9238. The warranty states that the Product will perform substantially in accordance with the supplied written materials and Product information located on this Product web site page for a period of 1 year from the date of shipment of the Product and that the Product will be free from defects in materials & workmanship under normal use & service for a period of 1 year from date of shipment.